Ihre Anfrage wird als E-Mail an die bei uns hinterlegte Kontaktperson bei MEN Mikro Elektronik GmbH geschickt. 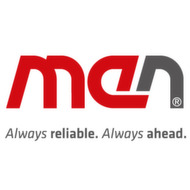 MEN Mikro Elektronik develops and produces standard and custom board-level solutions qualified for highly reliable operation in industrial embedded applications and harsh environments. Umsatz: 50 Mio. - 60 Mio.